Doing everything in-house may be an appealing idea to a business owners, but that isn't always advantageous. It pays to think critically about your business needs to determine how much of your marketing should remain in-house. Here are 6 questions to ask before deciding whether or not to outsource content marketing. 1. Is your staff in over their heads? If the actual legwork required to create all the pieces you need to execute your marketing strategy is overwhelming your staff—surely they have other responsibilities or perhaps it's a bigger job than anticipated—you may want to consider outsourcing your content creation. If you’re sensing your employees don’t have time, outsourcing is definitely worth it. Through journalistic interviewing, you’ll get great content (not rushed!) to complete your marketing strategy and your employees will thank you. 2. Is your marketing department in need of quality writers? You may have a marketing department and a strategy worked out, but most companies don't have dedicated writers on staff. Carving out time to write compelling content when you have other responsibilities can be challenging. Outsourcing your content marketing, leaves the in-house team free to develop campaigns, place advertising, and run other aspects of a complete marketing strategy. 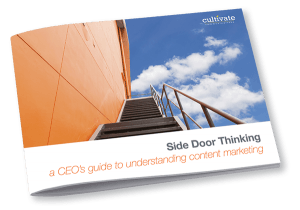 Deciding to outsource content marketing makes perfect sense. A content marketing agency will schedule posts, wrangle writers, and edit content for consistency and quality. A content marketing team works with your marketing department to create an editorial calendar, identify subjects and information your customers are searching for, and produce quality content on schedule. 3. Do you need temporary workers with honed writing skills? Maybe you're covering most of your needs, but you need a little help—perhaps to cover writing blog posts while your marketing coordinator goes on vacation or medical leave, or maybe to write long-form content your marketing department can't make time for. You could hire a few temps to fill in, but content writing is a specific skill set and great content requires experienced writers. A good content marketing agency can fill the gaps and provide support to your team when they’re busy, without taking up valuable real estate in your office. 4. Does your current content resonate with your customer base? Filling a website with relevant and authoritative content can be a challenge. You may choose to gather topics in-house, based on social media listening, keyword research, and competitor intelligence, before engaging with a content marketing agency. Savvy content marketers will help you truly listen to your customers and research relevant keywords that speak to your customers’ pain points. 5. Are you relying solely on old-school marketing techniques? Some businesses are mired in history; still using the same marketing tactics that worked twenty years ago. A surprising number of SMB and B2B companies have no website or a website that's little more than a brochure. Your website is a crazy-powerful marketing tool. If you're not using it, you definitely need help with your content marketing efforts. Building an authoritative website is time-consuming...and ineffective if you lack SEO experts in-house. Today’s most successful businesses rely on a multi-channel, integrated marketing approach that incorporates both traditional marketing methods, like print and direct mail, with today’s newest advances in digital marketing trends, like segmented email marketing, great SEO, and company blogging. 6. Are you a newly launched business? Content marketing agencies are flexible and can produce as much or as little content as needed—often a cost-effective option. You may want to tell your brand story with style. You may want to build a big library of resources at first, then scale back to scheduled blog posts later. As your needs change, content marketing experts will create content that changes with your business, whether you need help with website copy, blog posts, whitepapers, infographics, or other helpful, relevant and informative content your clients are searching for. Content marketing is more competitive today than ever. If you can't meet your content needs for whatever reason, deciding to outsource content marketing is a great solution. And hey, you don’t necessarily have to choose between in-house and outsourced marketing. You can outsource some tasks while keeping other efforts in-house. Work with your content marketing agency to create a relationship where you can easily scale up or down to produce as much (or as little) content as needed. You’ll get writing that’s well-researched, interesting, grammatically correct, and SEO-friendly—and it’ll help you attract and retain more great prospects and customers.